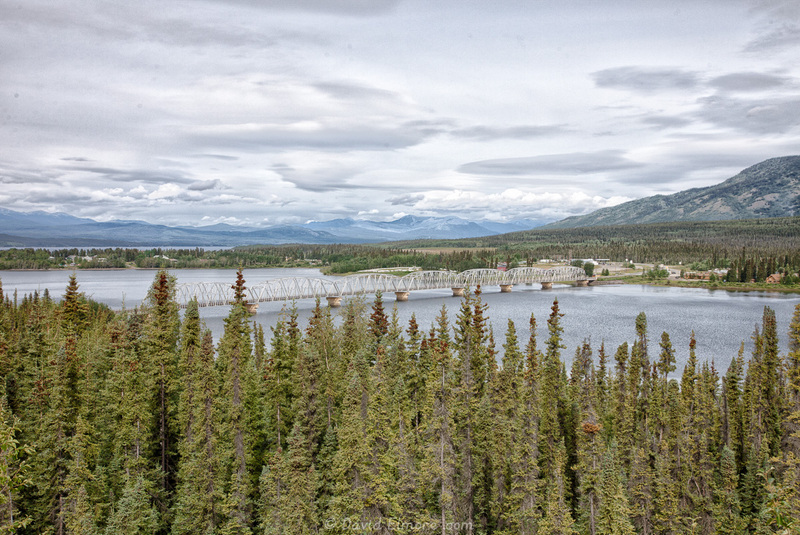 From Teslin Lake we drove the Alaska Highway to Watson Lake. In the beginning of the day, the Teslin Lake was to our east. It is so long it was with us for quite a while. Finally we came to Nitsutlin Bay, where the Nitsutlin River enters Teslin Lake. 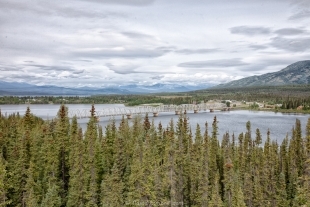 Here is the longest bridge on the Alaska Highway. At this point we headed away from the lake. At one of the rest stops we read some interesting information about the Cohoe salmon in this area. They are not plentiful here as the water is cold and not nutrient rich. 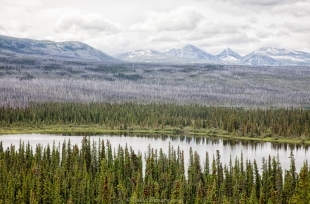 What is remarkable is that these salmon are born here in the gravel beds of these lakes and rivers, then follow the rivers to the Yukon and then the Bering Sea. 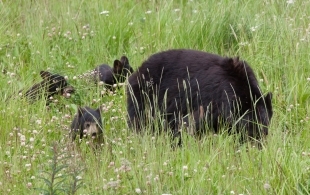 After living 3 – 5 years in the Bering Sea they return here, traveling over 1800 miles upstream on the Yukon and its tributaries, to spawn and die. We have yet to see one of these salmon runs and probably won’t. Our timing has been off – too late for the eulachons when we arrived in Alaska and too early for most other varieties as we passed through different areas. 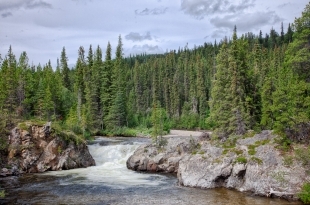 Different rivers and different kinds of salmon have different spawning schedules. We passed Swan Lake with some interesting sharp peaked mountains across from it. They look like volcanic island peaks and, in fact, they are. The peaks were originally formed under water off the coast and through plate movement and uplift are now far inland. 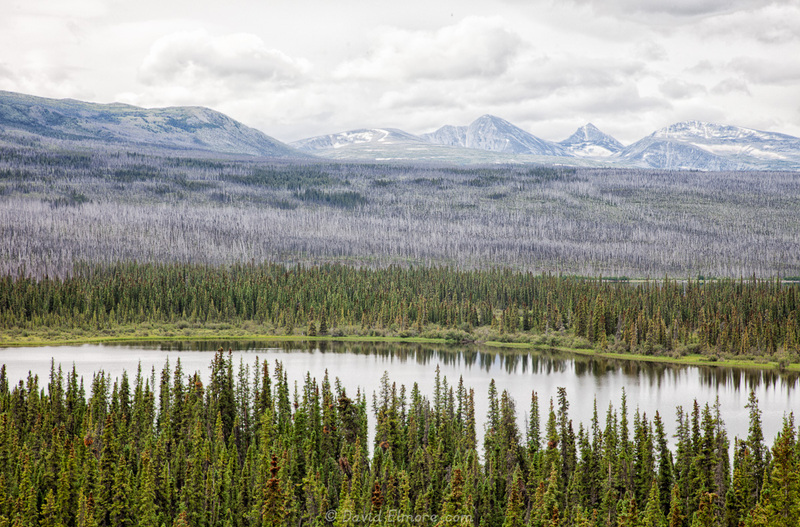 We soon began to see views of the Cassiar Mountains and crossed a continental divide. Waters flowing to the west of it flow into the Swift River and the Yukon and on into the Bering Sea 2300 miles away. Water on the east slope flows into the Rancheria river and travels to the Beaufont Sea about 2600 miles away. We stopped for lunch and took a short hike along a path that led to the Rancheria Falls. 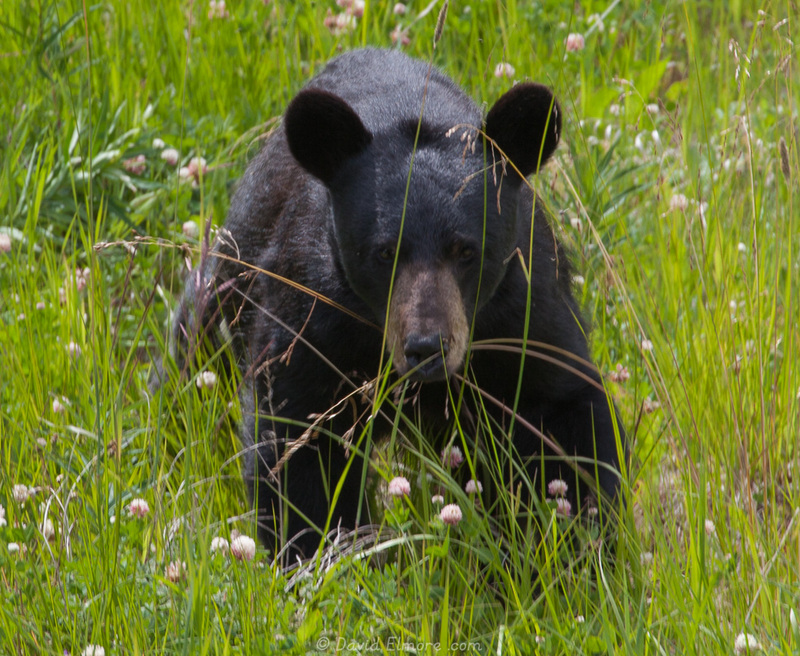 A pretty spot which is clearly frequented by moose (lots of droppings), but not today. 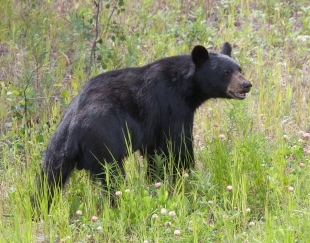 We still haven’t had a good, up-close view of a moose. The wildflowers in bloom here are the same ones we were seeing in Southeast Alaska in June. Up this high (2800) and this far inland, the growing season is very short – average last frost date, June 19 – average first frost August 19. 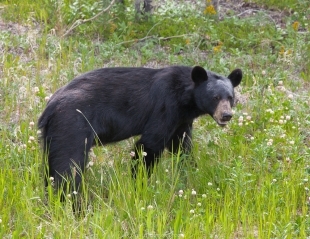 As we continued southeast we did have some good black bear sightings along the road. 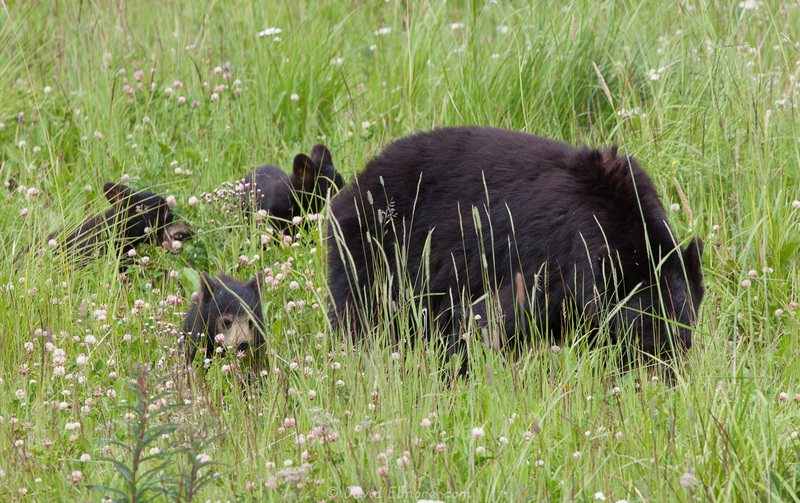 Two single bears and a mother with three babies were grazing along the road. At one point David left the car and walked back for better pictures of one of them. 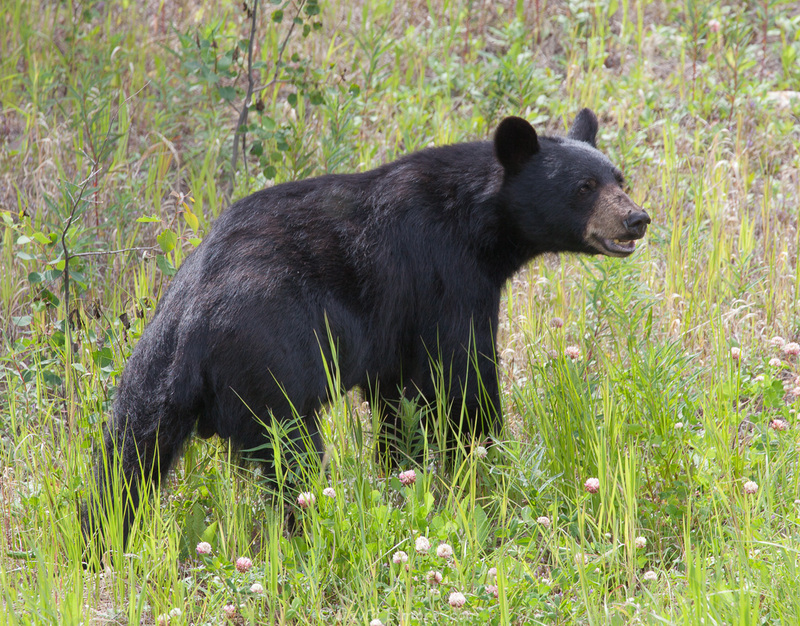 When the bear stopped grazing and made a charge at him, David made a quick retreat. He said it certainly got his heart beating faster than our short hike had. In the town of Watson Lake we saw two short movies in the planetarium at the Northern Lights Center. One was on black holes and the other about the northern lights. Both were excellent. We then walked across the street to see the “Sign Forest” for which Watson Lake is known. 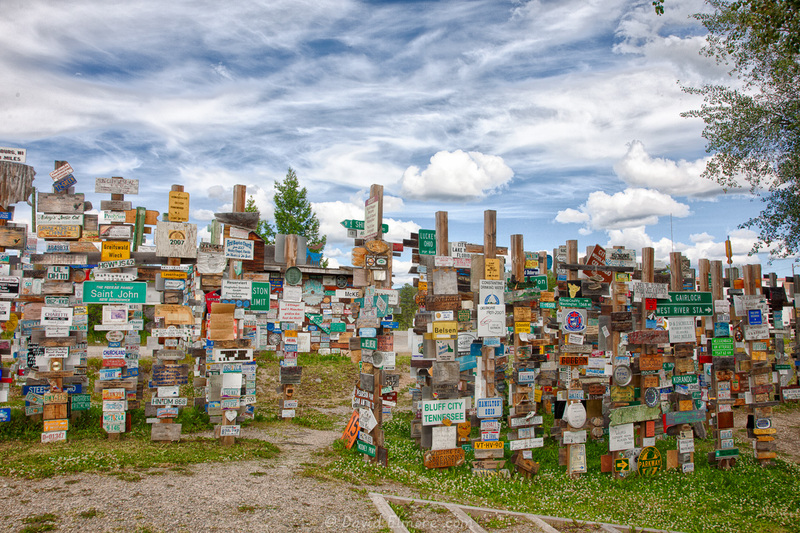 The “forest” was started in 1942 by a US soldier working on the Alaska Highway who tacked up a sign there with his hometown name. Since then, travelers have been adding signs, until now there are over 78000. 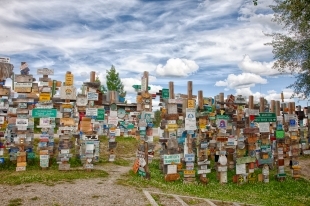 Signs range from professionally made signs commemorating an Alaskan trip to stolen street signs to handmade signs made on any surface available which could be permanently marked (e.g., a metal pie plate written on with nail polish). From Watson Lake the Alaska Highway continues on to Dawson Creek – the “beginning” of the highway. When the highway was being constructed in 1942, many thought of Watson Lake as the beginning of the highway as there was already a rudimentary road between Dawson Creek and Watson Lake. Watson Lake had for years a very busy airstrip as planes on the mail run from Edmonton to Vancouver were refueled here. During the 1940s the airport became almost completely a US run operation as planes stopped here on the way from Montana to Alaska. Planes that were given to Russia on the wartime “lend-lease” program were brought through here. The Yukon Government currently runs the small airstrip. 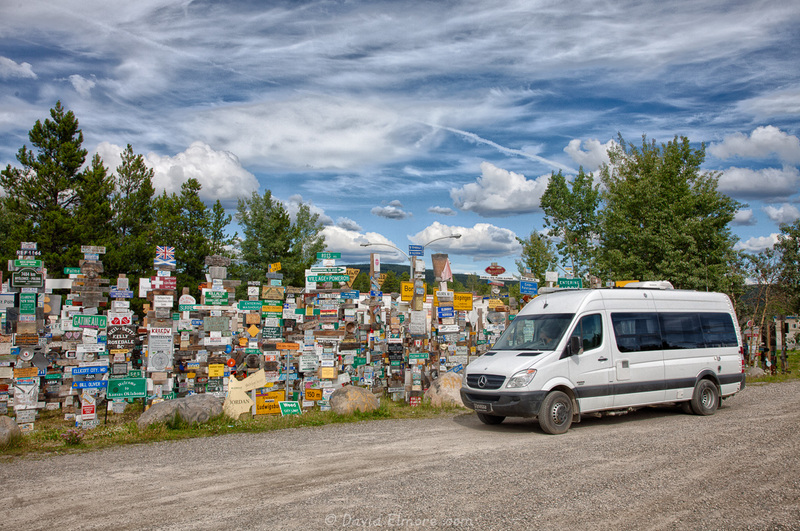 We stopped for the night at the Watson Lake Yukon Territorial Campground just outside of town. We managed to build a nice fire and grill our dinner of steak, eggplant and onions, and carrots (served with a salad) before the rain started. Watson Lake Territorial Campground Review: The Territorial Campgrounds continue to be great; we have not been disappointed yet. This one has about 70 sites arranged in two loops. All are large (some pull-throughs) and flat, with fire ring and picnic table. All sites are well-separated with lots of vegetation – pine, spruce, and poplar. Pit toilets and hand-pumped water are available. The road in from the Alaska Highway is about 3 miles of good gravel – smooth except for one washboard area at the entrance to the first campground loop. Fee: $12.